I’ve never much believed in New Years Resolutions, mainly because the turning of the year is no more likely to get me on a treadmill than bikini season or my gym instructor’s scornful “I haven’t seen you here in months” eyes. 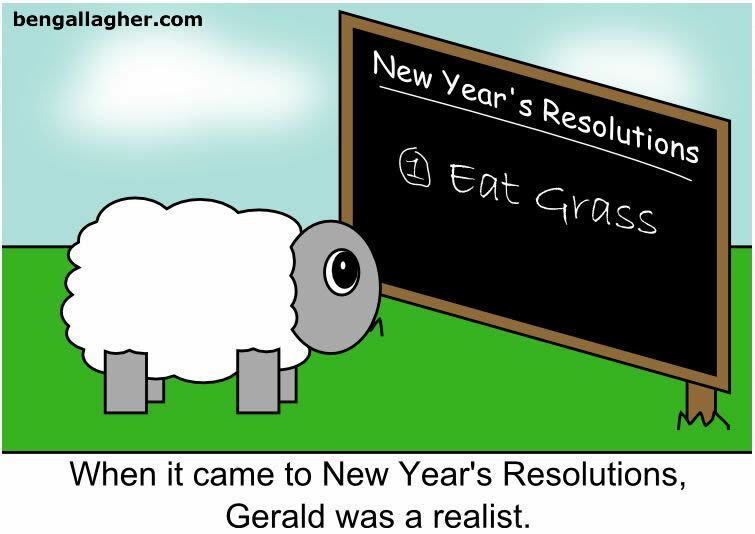 So just to be clear these are not resolutions. It’s two weeks into 2012, so we can agree that I’ve definitely missed the resolution making portion of the year. These are not so much ways to improve myself, and lets face it why would I want to (don’t answer that) but instead, more ways to ensure I don’t reach 2013 without a single thing to show for myself aside from that increasing Jack Daniels dependency. And shoes, far, far too many shoes. 1. Get a job, one which pays more than the most minimum of wages. As much as I love my mum, I can’t spend the next 27 years living at home, which incidentally is how long it would take me to put a deposit on the very shittiest of flats with my current salary. 2. Sky dive, or bungee jump, or take up aerobatic flying lessons or pretty much anything in this general category that is guaranteed to make me pee my pants a little bit. You’re never going to be amazed in life, unless you do some things, which are a little bit amazing. 3. Succeed in getting George Michaels “Faith” out of my head. It’s been stuck there for approximately 3 years, and whilst before it was bad, now it also comes with the accompanying dance moves compliments of J.D. No not the liquor, the character, in Scrubs. 4. Visit a county, where the rain is warm. Or perhaps before I get ahead of myself, I should aim to visit a country which is not Cypriot, Greek, Greek-Cypriot or any other variation which results in me eating Feta in the village tavern owned by Stelios. 5. Slow dance. Not jokingly. Not with my God-sister while drunk. Not with my dog (who for the record does an excellent Waltz) and not with my fingers on the steering wheel whilst bored in traffic. The list could go on. A result of a very unproductive 2011 no doubt, I am left with a million and one things I was always meant to, but never quite got around to doing. I guess I could add teaching my dad how to text to the list and losing that last pound that just won’t budge from my thighs, but like I said these’s aren’t resolutions, and I am not a miracle worker.